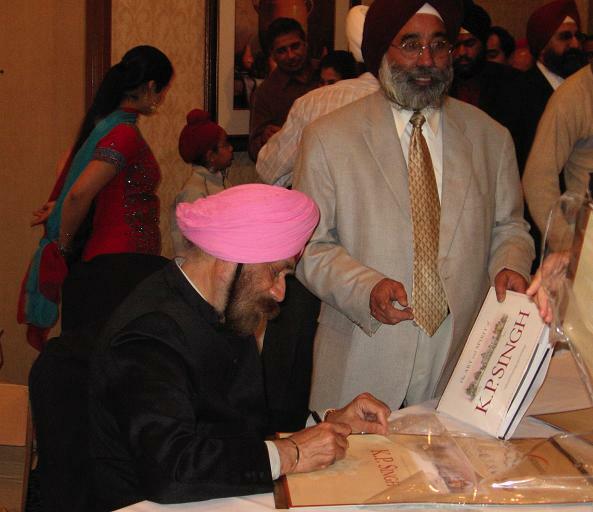 With some 700 guests from around the USA, Canada, England, India, and Australia, it was an exciting affirmation of the recognition of the arts as an important element of Sikh heritage and vision as we transplant our ideas, dreams, and investments in the global cultural and spiritual landscape. Seven distinguished Sikhs were recognized with Miri-Piri Heritage awards for their outstanding contributions to the arts, medicine, heritage, faith, and community service. Awardees included Dr. Amarjit S. Marwah, Bibi Inderjit Kaur Khalsa, Ph.D., Bhai Dya Singh, Dr. Gurpal Singh Bhuller, Dr. Harvinder S. Sahota, Harbinder Singh, Kanwal Prakash Singh, and Dr. Paul Michael Taylor. Weekend festivities also included The Spinning Wheel Film Festival featuring films by directors and producers including Gurinder Chadha, Kavi Raz, Sofina Uberoi, Reema Anand, and others. as an invaluable community, national, world heritage. We need to challenge ourselves to the seriousness of this cause; clearly define the special place of our heritage in the larger tapestry of rich heritages that today grace the national cultural landscape. We must make personal commitments and room for heritage in our study and priorities before we would be able to attract the attention of others to this vital resource. There is an unmistakable relation between our own support, pride, and passion about an idea and our ability to inspire others. Setting the right example, making the right noise may attract the right attention; carefully presented ideas may bring unexpected interest; and coordinated networking may produce undreamed-of results in time. We must assure the place of our history, popular folklore, cherished spiritual and cultural connections, and creative heritage amidst the transcending frontiers and emerging global culture. United States, with the convergence of many ethnic, cultural, and faith communities symbolizes an ultimate experiment in international living; is engaged in discovering and shaping a common destiny for her 300 million citizens. From here, the message has been going forth to distant lands that diverse and distinct faiths, cultures, people, and experiences can, and must work together for the betterment of man. This represents a tribute to our shared humanity; we all have a special stake in this effort. Towards this end, let us place seva ( well-being of others) ahead of our private spiritual ideas, institutions, and associations, remembering and meditating upon the Sikh sacred commandment that: “God is Love. To love God is to love all His Creation. Every act of service is an offering to God.” Let us place our cultural legacy, endangered or neglected priceless heritage, ahead of the ordinary, expedient, and limited-value investments. Our heritage deserves careful nurturing and understanding; it is a living and evolving entity. We must identify the significant, unique, and charming facets of our heritage before we can seriously talk about preserving, restoring, and transplanting our rich legacy in our new environment. We need to research the relevant landmarks, artifacts, and associations with the principal architects of our faith, culture, and creativity and protect them from reckless and expedient “renovations” at the hands of zealous guardians of priceless treasures and allow them to be lost forever. Then we must apply the latest technology and preservation techniques available to retrieve as much detail and information as possible. This must be a non-negotiable urgency. The Sikh Heritage Complex at Anandpur Sahib, The Sikh Exhibit at the Smithsonian, and Rubin Art Museum are outstanding efforts at “showcasing” Sikh heritage. The leaders responsible for these unique and lasting gifts to the world must be commended for their vision. We are the fortunate connecting bridge to our fathers, our past, guardians of our heritage. We must prevent its destruction by neglect, shortsightedness or by design. Great ideas demand sacrifices, need a sense of urgency to safeguard the fragile and vanishing symbols and traditions, and thoughtful investments in time and energy to secure their rightful place in the future fabric of our national and global cultures. Much is possible! Just look around the Jewish Holocaust Museum and the Museum of Native American Indian in the nation’s capitol. Then imagine a Museum of Sikh Heritage for the Western Hemisphere in Los Angeles. It is a big dream. The Native American Indian weaves awesome “dream-catchers.” It is an artistic creation, a symbol, a living reminder. We can all be dream-catchers, dream-shapers. We will need the will and prayers, vision and friends in and outside our communities as guides and mentors. Why should we care? We should care because we are people with a glorious history and guardians of ancient knowledge. We come from a soil that has been an important frontier and gateway to Indian civilization, witness to “winds of culture,” each leaving its own deep imprint on the arts, culture, and our spirit. We are hardworking, patriotic, and daring pioneers and bring a proud record of unmatched achievements. We love life, color, and fun. We have a faith that offers a universal message of equality, justice, human dignity, and goodwill towards all. We have an important story to tell; create an honored place to “showcase” our heritage. inspirations that have the power to transform; instill in us pride; offer us unique sounds, images, cultural and spiritual echoes; introduce us to embellishments, icons, myriad interpretations and manifestations that thread us into the universal language of mankind. Every image, sacred and inspiring thought, and design detail in the 2007 Sikhpoint.com Interfaith Calendar reminds us of our important challenge and responsibility. My art is simple, direct, and with a message that the magnificent architectural landmarks are a vital component of our heritage. Architecture is much more than the size, shape, design style, materials and treatment. Architecture is a celebration of life, spirit, arts, inspirations, and imagination. Architecture is the enclosure and laboratory where great ideas and giants of human civilization have engaged in endeavors to serve, enlighten, and uplift man towards the ultimate breathtaking temporal experiences, where arts and sciences combine to create wonders, solve mysteries, and imagine the unfathomable. Our historic and sacred sites offer reflections and lesson that are an important source of knowledge and wisdom; their careful preservation, restoration, and integration into our aesthetic, cultural, and societal fabric must be an important and sustained passion and commitment. Serve not as an obstacle or unwelcome challenge, but a cause for celebration. Each of us engaged in making such promising reality, a universal mandate.